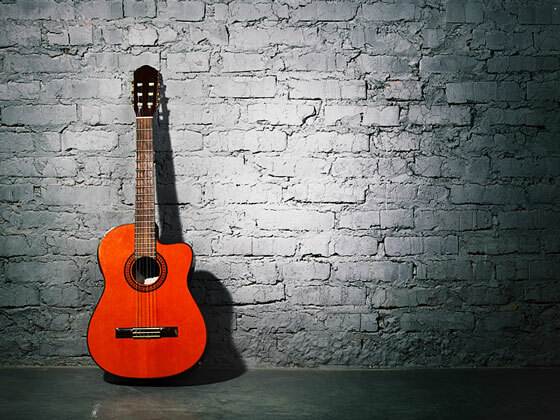 The acoustic guitar is a popular stringed instrument that originated in Spain. It has a flat, waisted body, a round sound hole, and a fretted fingerboard, or "neck," along which run six strings. The strings are fastened to tuning screws at the top of the fingerboard, and to a bridge that is glued to the instrument's sound board or "belly" at the other end. The strings on acoustic guitars are usually made of steel. On classical guitars, the top three strings are usually made of nylon or natural gut, while the lower three strings are metal. The strings are tuned to E, A, D, G, B, and E (starting with the second E below middle C and ending with the E above middle C). Chelsea Diana. American City Business Journals. Thursday, 18 Apr 2019 14:33:58 +0000. Premier Guitar. Tuesday, 16 Apr 2019 13:16:00 -0400. Acoustic guitars are the instrument of choice for many country and folk music guitarists. High quality acoustic guitars generally feature solid wood construction, with spruce or cedar tops and rosewood or mahogany sides and backs. Medium quality guitars may combine solid wood tops with laminated sides and backs, while entry level instruments are often made from laminated woods. Guitar necks and fingerboards are typically constructed from stiff woods such as mahogany, ebony, and rosewood. Guitars are designed for either right-handed or left-handed players. With a right-handed guitar, the player's right-hand fingers pluck or strum the strings while the left-hand fingers are positioned at the appropriate frets to produce the desired pitches. How does an acoustic guitar produce sound? Quite simply, when a guitar player hits a guitar string, the string absorbs energy and begins to vibrate. However, this alone is not enough to create sound waves that can be heard. In order to be heard, the energy must come into contact with a mass of lower density. The guitar's hollow body enables this to happen. In a nutshell, the body of the guitar acts as a soundbox. The energy from the vibrating strings travels through the saddle and bridge over which the strings pass, and eventually to the soundbox. The soundbox amplifies the vibration of the strings, so that the sound can be heard. The guitar's volume and projection are a result of the soundbox. How is the soundbox assembled? The front of the guitar is called the "soundboard," while the sides of the guitar are called the "ribs." There are small strips of wood that allow the front, sides, and back to be glued together, and these are called "linings." Once the pieces are glued together, the joints are hidden by "edging." The inside of both the soundboard and the back of the guitar will have something called "strutting" or "bracing." Basically, these are strips of wood that are laid across the surface in a pattern. The struts serve to strengthen the wood and prevent it from warping, but they also allow the soundbox to vibrate and produce the best possible tone. Tone, simply put, is what the guitar sounds like. Even high-quality guitars will differ in tone. The design of the soundbox will affect the sound characteristics of a guitar; as a result, many guitar makers, known as "luthiers," will change the design of each guitar slightly to produce varied tonal qualities. The goal of every luthier is to ensure that their guitars have even tonal gradations, with no areas where the tone or volume changes abruptly, and no areas where there is over-accentuated harmony. Different designs mean that some types of guitars are better suited to particular styles of music. For example, Martin flat-top guitars are popular with fingerstyle guitarists because of their clarity and defined bass pattern, while Gibson flat-tops are frequently used by country musicians because of the rhythmic sounds they produce when chords are strummed. Most acoustic guitars share the same basic shape. The body looks like a figure-eight made up of an upper bout, a thin waist, and a lower bout. However, the dimensions of these three parts of the guitar will determine what it sounds like. Guitars with smaller upper bouts have enhanced treble frequencies, while guitars with larger upper bouts have enhanced bass frequencies. Acoustic guitar sizes vary as well. Flat-top, steel-string acoustic guitars come in standard, jumbo, and dreadnought sizes. Today, there are a wide variety of steel-string and nylon-string guitars available on the market. Browse this website, AcousticGuitars.us, to learn more about acoustic guitars and the people and companies that make them. For acoustic guitar photos and an overview of their origins, please see History of the Acoustic Guitar. Most of the guitar shops listed below feature a good selection of acoustic guitars, ranging from popular-price beginner guitars to high-end pro quality guitars. They may also offer complete guitar packages as well as guitar cases, straps, gig bags, and other guitar accessories. Buy acoustic guitars, acoustic-electric guitars, amplifiers, and guitar effects online at Guitar Center. Find vintage guitars and acoustic guitars as well as information and resources. This musical instrument megastore with nationwide locations features guitars, keyboards, and drums as well as brass and woodwind instruments. In addition to musical instruments and accessories, visitors can find sound and recording equipment, sheet music and videos, and music software and computers. This well-known Staten Island, New York guitar shop features acoustic guitars, classical guitars, banjos and mandolins. 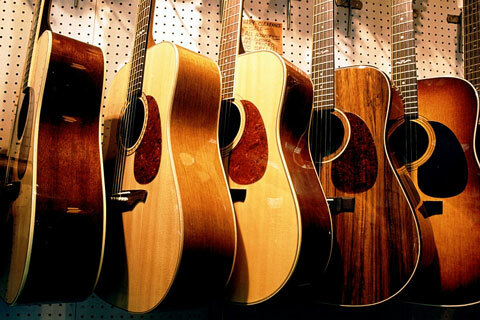 This family owned and operated music store features a variety of acoustic guitars as well as bluegrass and folk instruments. Find quality guitars, accessories, and gear from this popular manufacturer. Establised in 1833, Martin is a leading manufacturer of acoustic guitars and guitar kits. This guitar manufacturer offers acoustics, bass guitars, custom guitars, and historic guitars. Find high quality steel-string and classical guitars. This Canadian guitar maker offers the Godin, Seagull, Art & Lutherie, Simon & Patrick, Norman, and LaPatrie brands. Seagull provides a selection of hand-crafted acoustic guitars. This popular Japanese guitar brand provides a wide variety of acoustics and acoustic-electrics. Well-known for their electric Stratocaster guitars, Fender also offers a variety of acoustic models. Guild Guitars manufactures a wide range of acoustic and acoustic-electric guitars. This Texas-based builder offers fine acoustic steel string instruments. 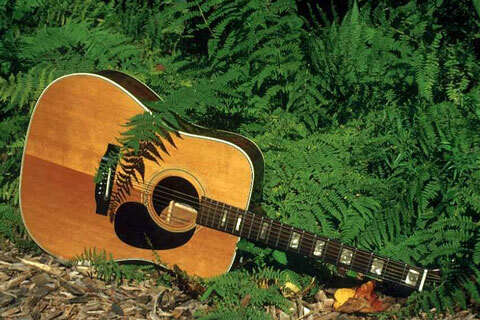 Find acoustic guitars engineered for ruggedness and better tonal balance. Epiphone offers 6 string, 12 string, classical, acoustic-electric, and bluegrass guitars. Here you will find a diverse line of popular acoustic guitar models. Doolin eatures handmade double-cutaway acoustic guitars. These fine acoustic guitars, mandolins, and basses are made in the USA. This Oregon guitar maker features acoustic guitars and mandolins. This California-based luthier offers custom handmade acoustic guitars. These Virginia-based makers of fine hand-crafted instruments capture the spirit of music played in the Shenandoah Valley. Find guitar workshops, classroom programs, music teacher resources, and guitar industry links. Locate guitar reviews and advice, luthier profiles, lutherie trends, new gear and accessories, and projects! Help and advice for beginner acoustic guitar shoppers and users.